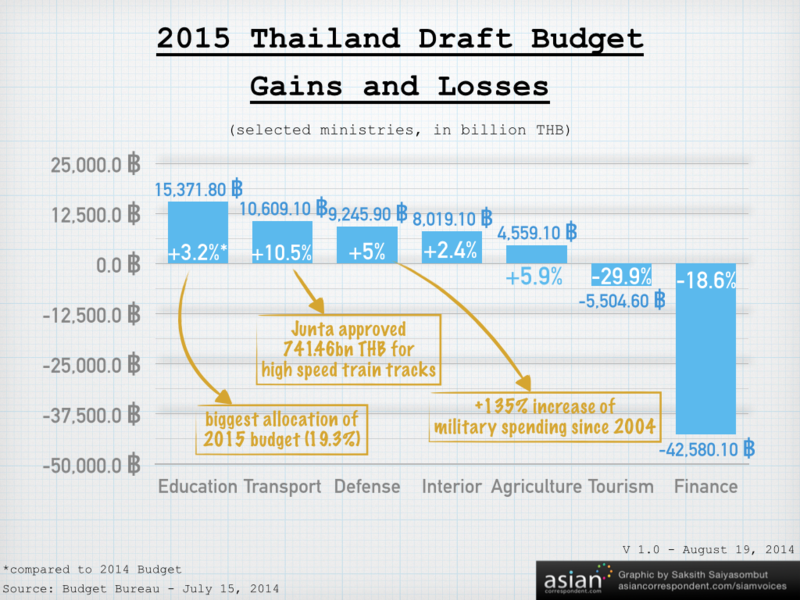 Originally published at Siam Voices on August 19, 2014 Thailand's National Legislative Assembly (NLA) approved the draft for the 2015 budget in its first reading on Monday. The body, whose members were all picked by the military junta and is thus dominated by active and retired military officers, rubber-stamped the budget bill with 183 votes and three abstentions (assumed to be the assembly president and his two deputies). Noting the lack of votes against the bill, junta leader and army chief General Prayuth Chan-ocha quipped: "Nobody had any problems. Nobody disagreed." An ad-hoc committee will screen the budget bill and it is expected to be completed by September 1 and put to a vote on September 17, all well before the start of the new fiscal year on October 1. By then a new cabinet is expected to be in charge of the interim government. Not only are ministries listed, but also civil servants, the bureaucratic system, provincial funds, the so-called "independent" government agencies (e.g. the obstructionist Election Commission) and many others. 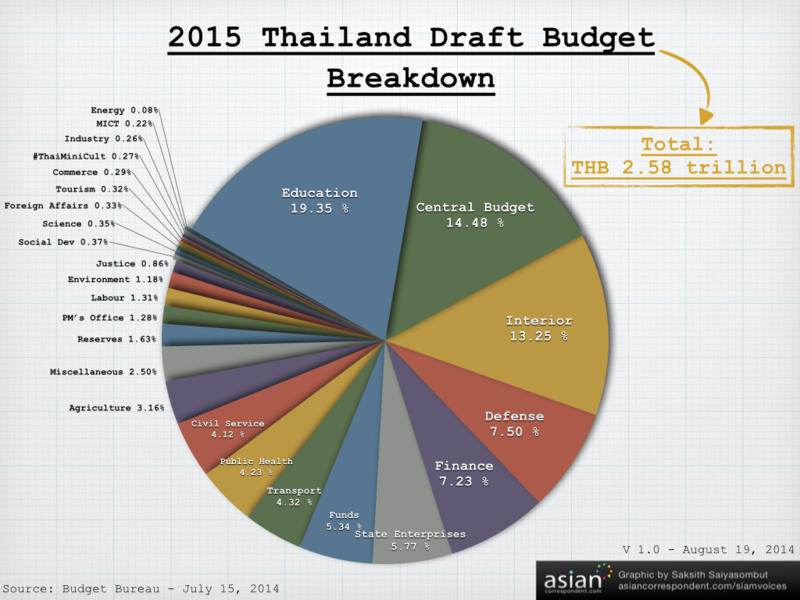 As is evident above, education set to get a big chunk out of that pie chart with 498.16bn Baht ($15.66bn) being allocated to the Education Ministry, but more on that later. The increased budgets for the ministries of transport, interior and agriculture are not surprising. On the transportation front, the junta has recently approved 741.46bn Baht ($23.3bn) for the construction of two high speed train routes from Thailand's industry belt on the eastern coast up to the north and north-east to Chiang Rai and Nong Khai respectively. The main goal seems to be to improve freight links with China, as evidenced by the fact that neither or fthe routes will pass through the capital Bangkok. The Interior Ministry is also in charge of many administrative issues down to the local level (e.g. appointed provincial governors). Whether that money will be used for any decentralization efforts has yet to be seen, even though that looks very unlikely at the moment. And with the military junta pledging to help rice farmers get the money that the toppled (elected) government's rice subsidy scheme couldn't pay out, the rise of the Agriculture Ministry's budget is unsurprising. On the other end of the spectrum, the massive cut for the Finance Ministry could also be related to the rice scheme and thus a punishment of sorts by the military junta. The loss of almost a third of the Tourism Ministry's budget appears to be counterintuitive, as tourist arrivals are currently down 10 per cent compared to this time last year - unsurprising, given the prolonged political crisis and its (politically) violent resolution. As regular readers of this blog know, Thailand's education system leaves muchto be desired and is a serious concern not only when it comes to regional competitiveness, but also - in the opinion of this author and others - one of the root causes of why Thailand has a prolonged political crisis in the first place. Previous governments in Thailand were already spending a sizable amount of its national budget for education, but ultimately more money was thrown at the problem rather than a complete and long overdue overhaul of the curriculum. Noteworthy is the repeated emphasis by junta leader and army chief General Prayuth Chan-ocha to re-examine and thoroughly reform Thailand's education system. The 498.16bn baht ($15.66 billion) are more likely to be spent to teach Thai children about the "Thai values and morals" that Gen Prayuth has been preaching and to re-enforce the archaic, militaristic attitude at Thai schools, rather than critical thinking and individuality on the part of the students. After the military coup of 2006 (or 2549 in the Buddhist calendar) the defense budget rose annually between 25 to 33 per cent until 2010, before levelling off in 2011-2012. 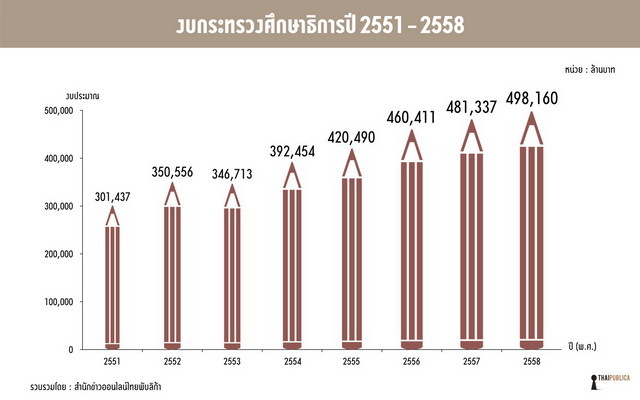 Thus, it comes to no surprise that military spending has grown over 100bn Baht ($3.14bn) or 135 per cent over the last 10 years and with next year's budget draft, the junta is adding another 5 per cent, or 193.07bn baht (US$6.07bn). 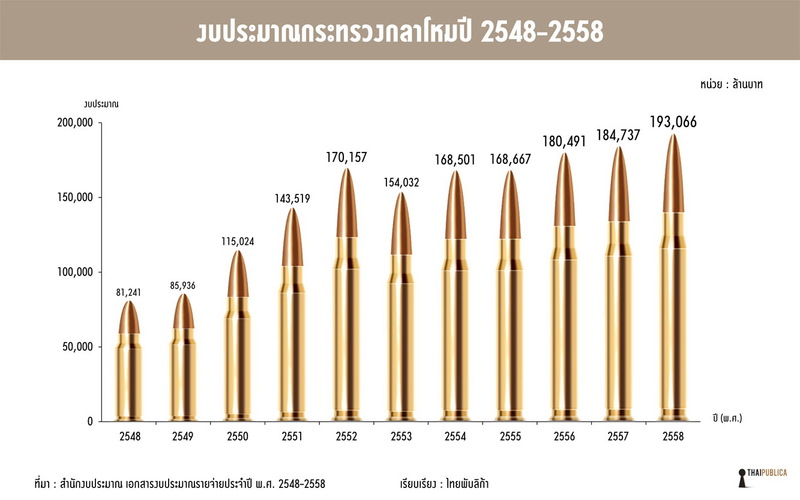 While these graphs are a good indicator about where Thailand's military junta is putting its emphasis, what they cannot directly visualize is the character of the junta and its leader Gen Prayuth, who said that if Thailand doesn't "purchase new weapons, then nobody will fear us". Prayuth also stressed that the junta only has "limited time" to govern before an eventual promised return of civilian power sometime later next year, but as stated in the interim constitution, Gen Prayuth and the junta will be calling the shots until then - and most likely beyond that, including complete control over the country's finances and an assembly to rubber stamp it.